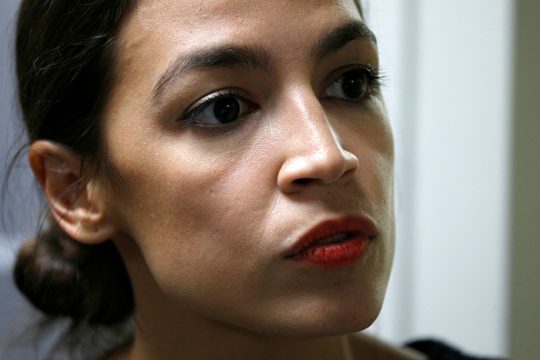 Democratic congressional candidate Alexandria Ocasio-Cortez said in a new interview her party couldn't compromise with the "insane people" on the right holding the country "hostage." Asked by Vanity Fair how she intended to balance her desire for rapid, progressive change with the need in Washington to make deals, Ocasio-Cortez said Democrats too often compromise even before getting to the table. "When you’re dealing with these insane people holding the country hostage on the right, you can’t go in with your end point. You have to go in with a strong position," she said. "If they’re trying to end Planned Parenthood, I don’t think we go in with, ‘No, let’s keep Planned Parenthood.' I think we go in with, ‘Let’s expand women’s rights to health care and have it guaranteed in every state.' I think we can compromise on our tactics and how we get there, but we can’t compromise where we’re going." She said she was "a thousand percent" committed to helping Democrats win the House, calling it "existential for the country" and invoking the possibility of impeaching President Donald Trump. "We are living in a world where impeachment is a realistic possibility," she said. "We’re going to square up on Medicare for all. There are certain issues where I’m going to make some Democrats mad if they’re trying to deliver paydays for Wall Street donors. But that doesn’t mean I’m going to burn the house down over it." Her victory in November is virtually assured in the heavily Democratic 14th District in New York City, which includes portions of Queens and the Bronx. Hillary Clinton carried it by more than 50 points in 2016. Ocasio-Cortez, a 28-year-old democratic socialist, burst onto the national scene when she stunned Rep. Joe Crowley (D., N.Y.) in the Democratic primary in June. However, she's stumbled several times in interviews since becoming a national figure, bungling facts about health care, unemployment, the existence of the upper middle class, and the Middle East. This entry was posted in Politics and tagged Alexandria Ocasio-Cortez, Democratic Party. Bookmark the permalink.